Girl spots boy across the bar. Their eyes meet. Girl, in a move of pure badassery, walks across the room and plants a kiss on her future husband, no introduction, no explanation, zero effs given. These are the moments great TV is made of. The premiere of UP TV’s Our Wedding Story on June 22nd at 9pm ET will have even the most hardened cynic sniffling by the first commercial break. The show explores the (truly) sweet love story of AJ and Michelle Manas. After their Hollywood-esque meet cute, the pair began dating long distance until AJ was diagnosed with Lymphoma and Michelle, in a literal leap of faith, moved her life from California to Chicago to see her new beau through the brutal treatment plan. Tears were shed, hair was lost and regrown, and a full recovery was achieved. The couple faced down real adversity with a level of grace and positivity that will inspire any viewer. Some months later, AJ proposed (on one knee after a glider flight), Michelle accepted, and an absurdly beautiful wedding plays out in Santa Barbara wine country. The cinematography by Blue Kite Cinemas is as supple and gold-tinged as the landscape. Sliding comfortably into the slot right after Our Wedding Story is Crazy Beautiful Weddings, another binge-worthy docu-wedding series with a totally different vibe. Warning: if you are a DIY-Pinterest junkie you’ll want to have a pen and paper ready. The series follows Lynzie Kent, wildly creative wedding planner and fairly hilarious lady, as she transforms raw spaces into peoples dream weddings. In the premiere she and her team pull off an art installation – choose your own adventure themed reception with a teal colored wall of vintage shoes directing guests to the dance floor and riotous green chandeliers. The shindig turns out to be an interactive, pop art-inspired celebration that almost brings the bride, and Kent, to tears of joy (and back pain). So, what are six lessons we can takeaway from UP TV’s new lineup? In the premiere of Our Wedding Story Michelle Manas describes what she was thinking (or not thinking) when she walked over to a stranger at a bar (AJ) and leaned in for a kiss without saying a word. Honestly, props. Listening to your instincts in matters of the heart can lead to spontaneous and beautiful moments like that one. If you’re lucky, they can alter the course of your entire life. So go ahead, get lost in a kiss. Michelle and AJ Manas turned their wedding into a Lymphoma fundraiser by asking guests to contribute to the Lymphoma Research Foundation in lieu of gifts. They also asked their wedding vendors to provide discounted services and donated the difference to the Foundation. In the end they more than doubled their goal of $30,000, collecting close to $79,000. Excess is a pretty ubiquitous part of wedding planning, so it’s refreshing to see a couple take control of the overspending and put the proceeds toward a good cause. If you’re planning your own nuptials, consider making your registry a fundraiser, and choose vendors who support your cause and will contribute in their own way. You might be surprised how willing and generous your guests and vendors are when given the chance. 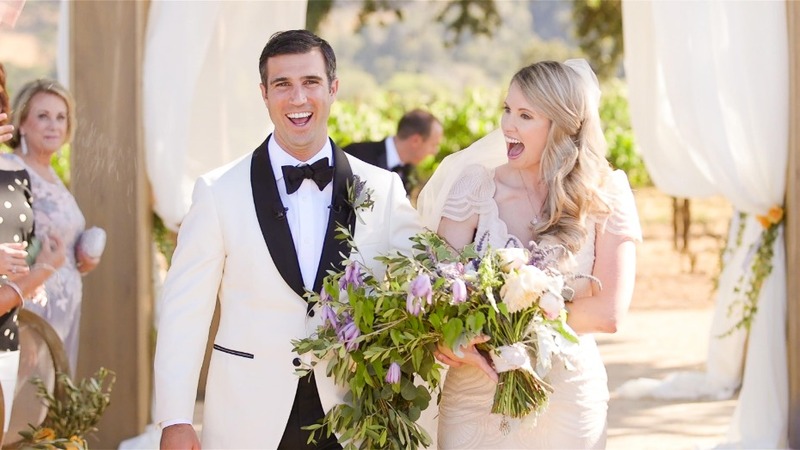 In the premiere of Crazy Beautiful Weddings, Kent pulled off the drama-filled reception by using big décor items that were handmade by she and her crew. Think: an archway lined with oversized paper leaves in a sweep of turquoise, a floor navigation system where guests can choose to go drink, dine or dance, and the aforementioned shoe wall. All of these DIY projects served as great conversation pieces yet were created with pretty simple craft store items like construction paper, electrical tape and a LOT of spray paint. The installation of big décor items can be a practice in trial and error. Leave as much time as possible to test and retest every element and expect things to go wrong. Kent’s team had 2 days for the setup and installation of Isabelle and Gary’s reception décor and were still scrambling to the very last minute to get everything finished. Tenacity and great sense of humor are the keys to success in… well, basically everything. The value of kickass floral cannot be overstated. That becomes apparent in Crazy Beautiful Weddings when wizard florist Tanya List Design swoops in during the final stages of prep to install wild, grassy chandeliers and oversized leaf-forward centerpieces. Her creations tie everything together and make the artsy, funky decorations look wedding-appropriate. So, prioritize finding a florist who absolutely shares your aesthetic, or make sure your wedding planner works with someone who you approve of. Don’t end up with an English garden when you want a wildflower farm. The success of Isabelle and Gary’s reception in Crazy Beautiful Weddings had a lot to do with the mutual love fest happening between Kent and super crafty bride, Isabelle. Isabelle even pitched in, creating turquoise tassels for the chandeliers and having a wine-fueled DIY session with Kent’s team in their office. Hiring a wedding planner who understands your vision might sound obvious, but it pays (so to speak) to be involved with each step of the process and build a relationship with your planner so you feel free to communicate honestly. Whether you’re planning your own wedding, working in the industry or are just an armchair enthusiast, UP TV’s new wedding programs are good-natured, well-made shows that will restore your faith in love, humanity… and crafts (natch). Catch Our Wedding Story premiering on Friday, June 22 at 9pm ET on UP TV and stick around for Crazy Beautiful Weddings at 9:30pm, also on UP TV. Ana Tiwathia is a copywriter and digital content strategist from New York City, and a writer/founder of 3 Days*. She has worked as a writer and editor for DailyCandy, Vice’s Motherboard, UNIQLO and is currently plying her trade as a freelancer on a variety of marketing and editorial endeavors. Ana hit the road at a young age, being dragged on bohemian adventures by her hippie nomad parents, relishing and resenting every moment. She has spent time living in Sudan, Jerusalem, and exploring far-flung locales of east Africa, Asia and the Middle East. She’s the proud mama of a tiny maniac, a sometimes yoga teacher and devoted New Yorker.